Founded in 1986 by Steve Sas Schwartz and Thomas Keiji Agawa, SKATE N.Y.C. was an iconic New York City skate shop through the 1980's and 90s that became home to many legendary NYC skateboarders, including Harold Hunter and HUF-founder Keith Hufnagel, both born and raised skateboarding in the streets of the city. A staple to the community, SKATE N.Y.C. helped foster an entire generation of street skateboarding by offering locals a headquarters at which to meet up, hang out, and then head out to session the curbs in front of the shop or Tompkins Sq. Park across the street. The founding artists considered SKATE N.Y.C. a conceptual art project, a way to unify community, their love of skateboarding, art, and business. Part of SKATE N.Y.C. 's groundbreaking story is being the first skateboard shop to merge fine art and skate retail. 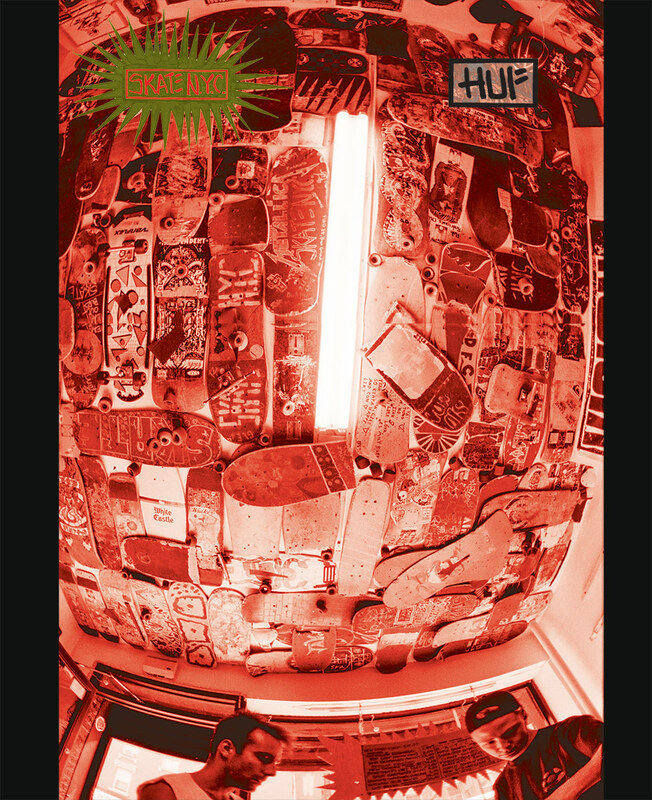 Below are pages from an oversized zine that records the history of the shop, that is being given away as a gift with purchase of items from the 2016 SKATE N.Y.C. collaboration with skateboard company HUF. 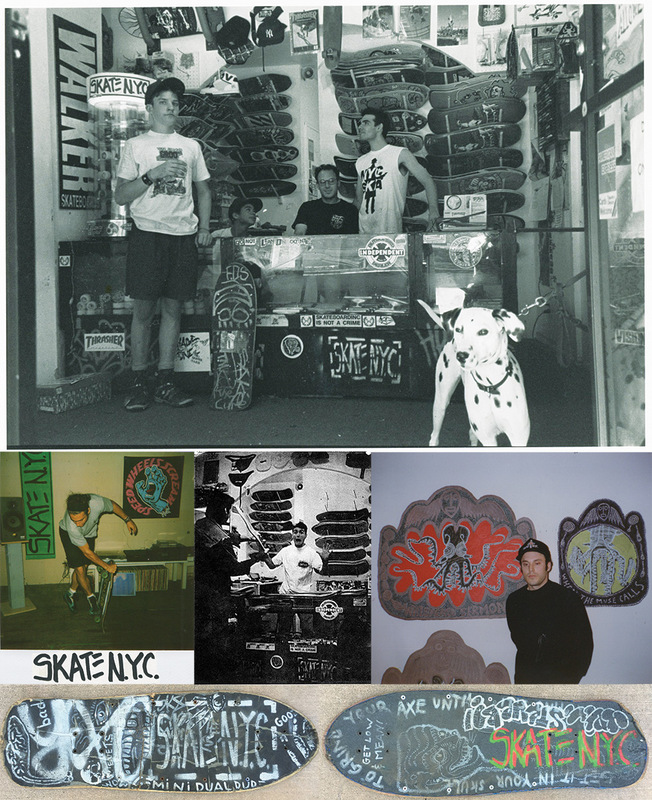 Below are examples of some of the art that hung in the SKATE N.Y.C. shop through the years. These are large scale pen & ink drawings, like underground comics scaled to gargantuan proportions. SKATE N.Y.C. also exhibited much of SAS's work that was not about skateboarding literally, but was in spirit. "ON THE OTHER SIDE OF THE LINE"
This fall 2016, the legendary skateboard company HUF and SKATE N.Y.C. have teamed up on a limited edition collaboration. Paint homage to an era by encapsulating the spirit of NYC skate culture of the 80s and 90s, the HUF X SKATE NYC collection features classic SKATE N.Y.C. graphic artwork consisting of fleece, long-sleeve and short-sleeve tees, hats, socks and also includes old-school skateboard deck shapes, deck rails, and co-branded Spitfire wheels. An informative skateboard documentary about the legendary skate shop SKATE N.Y.C. and its scene. ©1990. Narrated by Steve Sas Schwartz. Directed by John Bruce. SKATE N.Y.C. 1988-1989 In order of appearance: Luis Rodriguez, Cosmo Riley, Jamal Simmons, Harold Hunter, Hamilton Harris, Ryan Hickey, Steven Cales, Harold Hunter.